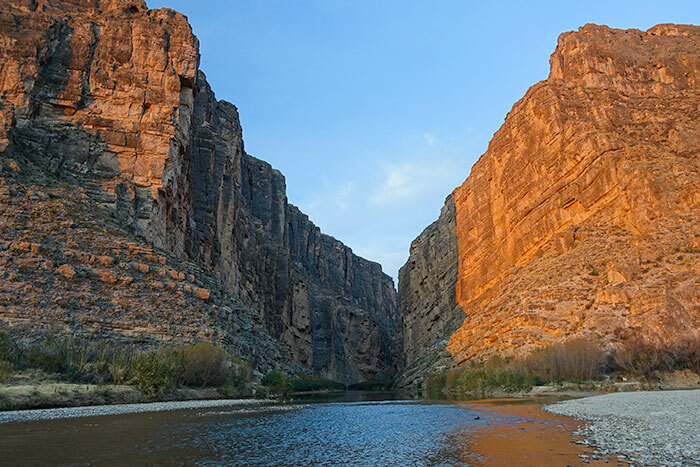 Santa Elena Canyon is one of the most iconic spots in Big Bend National Park. 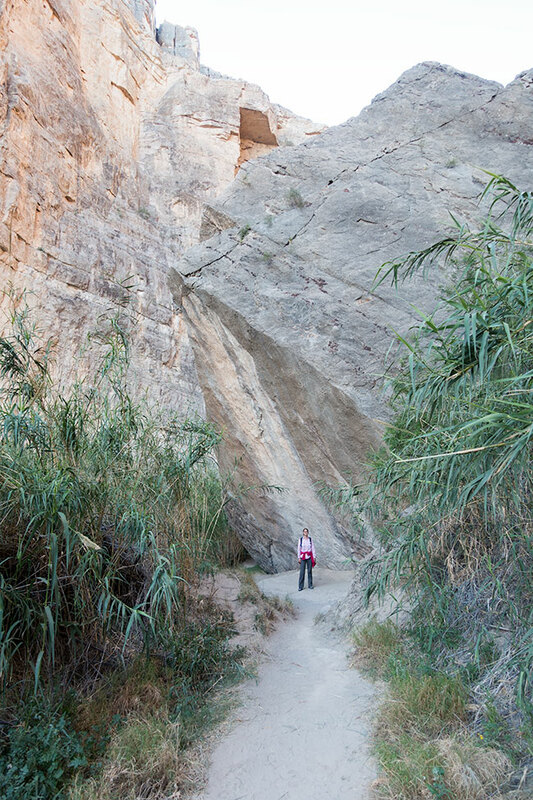 Unfortunately, this means that Santa Elena Canyon Trail is also one of the busiest trails in the entire park. If you want to hike this trail when there isn’t a crowd of people around, my recommendation is to get to the trailhead at daybreak. Sometimes there will be one or two photographers there hoping to catch a great sunrise from the mouth of the canyon, but generally it’s pretty quiet. If you get there when the kids are up and bouncing around, expect quite a bit of noise and some teeth rattling echoes along the trail. 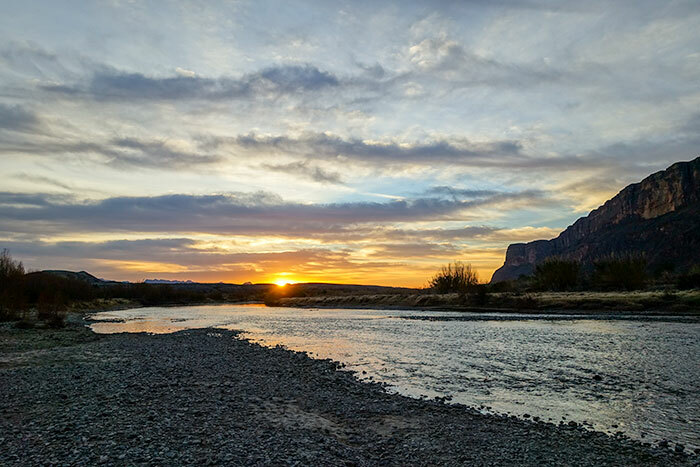 To get to the trailhead for Santa Elena Canyon Trail (29.167380, -103.610258), take a left out of Park Headquarters at Panther Junction and drive approximately 13 miles to take a left hand turn onto Ross Maxwell Scenic Drive toward Castolon. 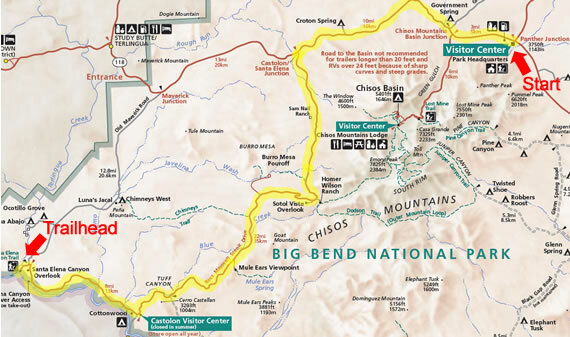 From there, you’re going to drive the entire length of Ross Maxwell Scenic Drive (about 32 miles) to the trailhead (don’t turn into the Santa Elena Camping Area or Overlook, but keep going until you see a sign for the trail, past the righthand turn to Maverick Road). Once you get to the parking area for the trailhead, there are plenty of picnic tables and a public restroom if you need it. From there, the trail begins on the South side of the parking area. 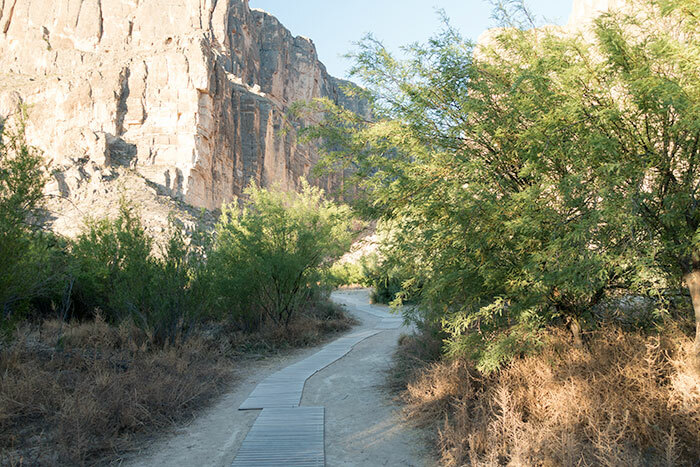 To start the trail, follow the board path through the sand down to the Rio Grande River. Once down at the river’s edge, you’ll be able to see where the trail crosses a muddy area on the right hand side of the water. 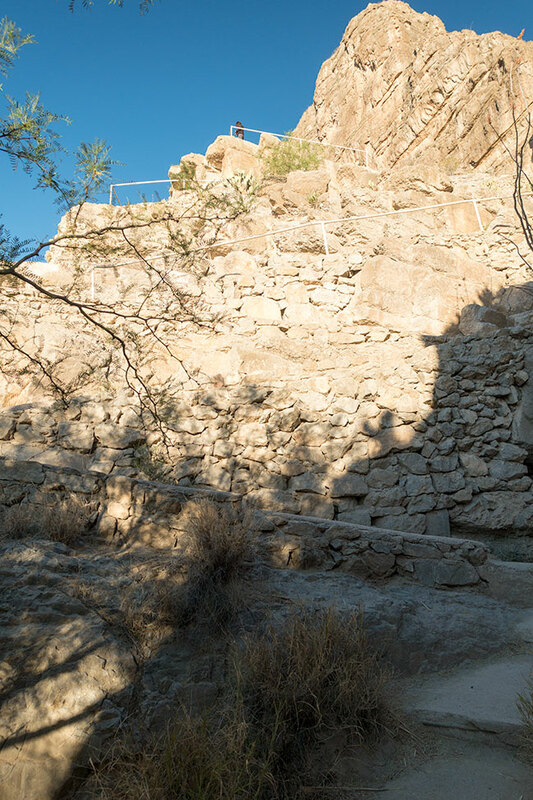 After you get past the mud and onto the trail, you’ll come to some stairs leading up into the canyon. They may make the trail look intimidating to some, but once you’re up them, the rest of the trail is very easy. Once you’ve moved along the trail far enough, you’ll start getting into the shaded part of the canyon where it’s much cooler. It’s difficult to grasp the scale of the canyon walls with a simple picture. I snapped the shot below of Elizabeth standing beneath a massive boulder just to give some context to the scale. 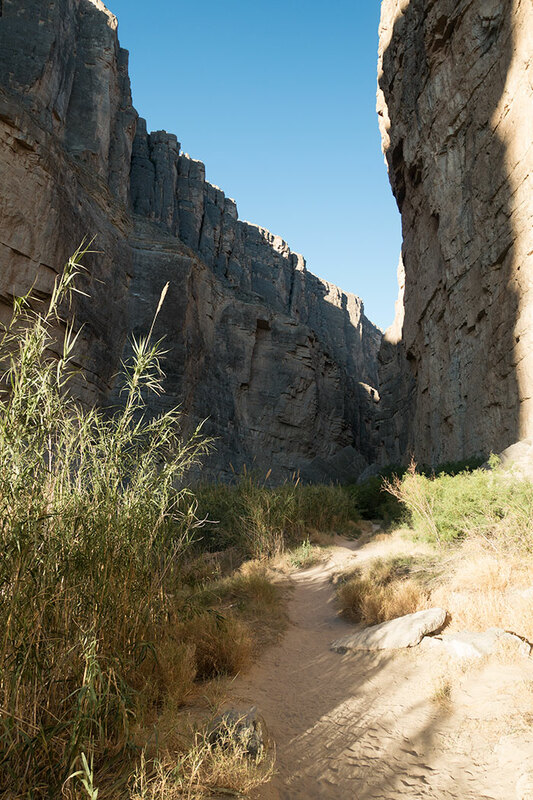 As you make your way down into the canyon, take some time and explore the boulders strewn about the canyon floor. There are some great little paths branching off of the main trail where you can step onto the rocks out in the river and watch the water go by or take a little break amongst the boulders. 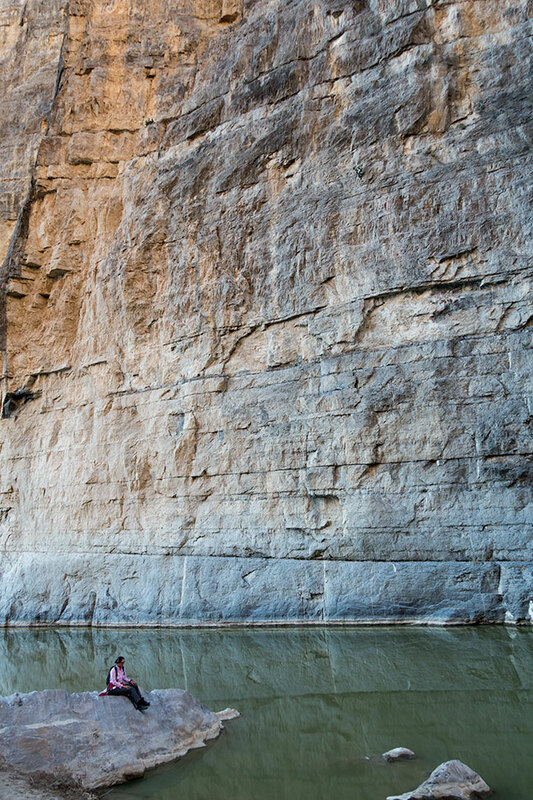 With the walls being so high in Santa Elena Canyon, I couldn’t get any GPS tracks put together for you to download, but it really doesn’t matter. 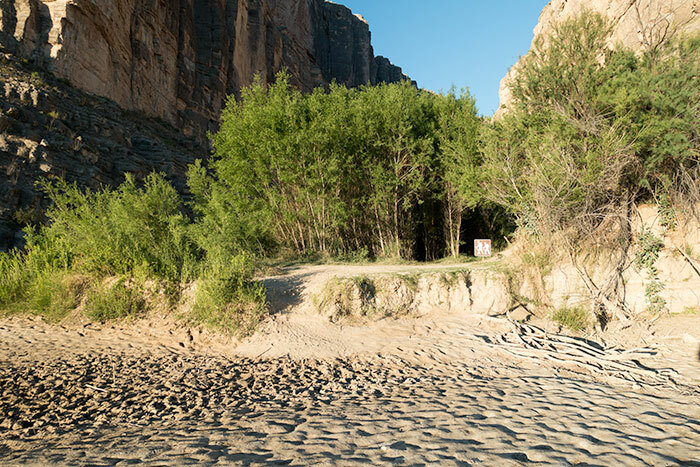 It would be virtually impossible to get lost on this trail without jumping into the Rio Grande and swimming for it. You can get in, but remember the center of the river is the international boundary and the water isn’t all that clean. You can also find some good sandy areas near the backcountry campsites on the East side of River Road. I wouldn’t consider any of it good swimming. Also, please talk to a park ranger about water levels and dangerous currents before going out there. I don’t know the current state of the river right now.